During the late autumn months and into early winter, anglers can experience some of the most exciting fishing that rivers have to offer by targeting steelhead. It’s this time of year where you’ll notice two types of anglers on the river: bass anglers looking for a few more weekends of fishing before conceding to the frigid winter and die-hard steelhead fly anglers who actually look forward to the winter. Whichever one of these camps you find yourself in, targeting cold weather steelhead is no joke and involves wading around in freezing water, as well as navigating questionable ice, all while trying to draw strikes from these mighty fish. To make this task a little easier on you, here are three tips for capitalizing on the cold weather steelhead action. This time of year, drifting egg flies and nymphs low in the water column and slowly enough to allow steelhead time to strike is your best bet. To do this efficiently, you’ll want to spool on a flat running line, such as Airflo’s Super-Dri Running Line, which is thin and slick and retains less water than traditional fly line. When the temperatures drop low, having this thin line will prevent your rod’s line guides from icing up as often, leaving you with more time to fish. Bonus Tip: Don’t shy away from using split shots to get your flies deeper quicker. On the river, it’s common for snags and breaks to leave fly anglers retying often. With this in mind, it might be wise to forego your favorite line-to-line knot and instead use a small barrel swivel. Purists may turn up their noses at the thought of mixing a swivel into their fly setup, but doing so will go a long way towards keeping you fishing and free from re-tying with shivering fingers. Bonus Tip: If you have a few flies you know will yield results, ensure you’ll spend less time tying by pre-rigging these flies to lengths of tippet the night before. 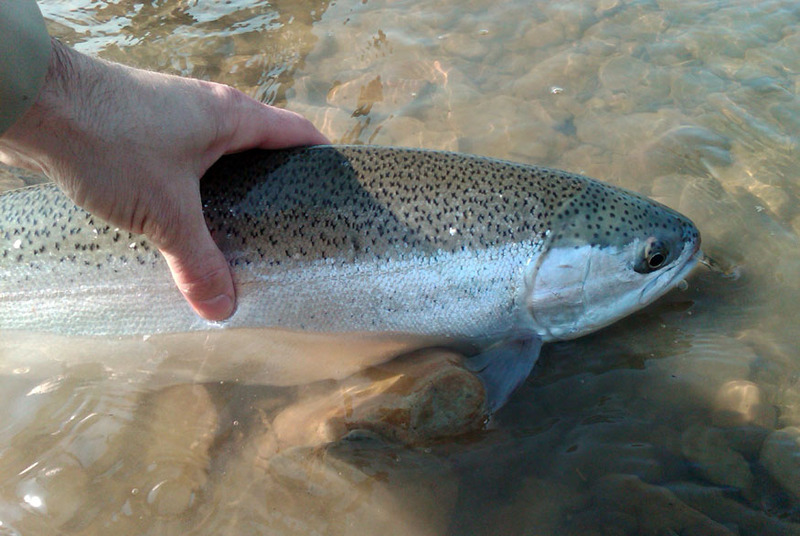 Steelhead tend to congregate in areas where they can conserve their energy, such as deep pools where the water isn’t moving as much. When one gets hooked, the commotion will scatter the rest of the fish for a few moments, but they’ll all return to that hole within a few minutes. A big mistake anglers make is pulling their lines when someone hooks up, when you can actually snag fish looking to snag a quick bite as they move back to the pool. If you’re wading and someone nearby hooks a fish, slip into that spot and get in a few drifts while they reel in their catch — if you know them, of course.